I arrived with The Hare at a large recreational park central to a city with a large, frightened population. It was too early for many to be out in force, and morning joggers tend to give oversized talking animals a wide berth. I helped The Hare to get up onto the park bench where Dmitri sat. It was cold, and while his shaggy fur could withstand the lightly-falling snow, we could see his breath as well as we could smell it. Dmitri chewed on a bone, and began to speak. The Hare looked curiously at him, the dog smiled like only a dog can, then The Hare flopped to his side, to cuddle his warm dogsbody, which was made even cosier by the lingering vapours of some cheap, paint-stripping Vodka. The Hare was insulted, jerked his head away from Dmitri’s side. He laughed under his breath. Dmitri continued; “You’ll have no problem. I couldn’t write for sushki, but you? A good writer must be able to dream, but also have a sense of responsibity, akin to that of the nuclear scientist. The darkest days of my life were when I lost faith in my own people – that was when I lost any notion of my responsibility as a human, and I took to drink and idly chewing these bones. My publishers have refused to take on my next project. I even got the citations wrong. I have seen so much suffering Peter, and it is true – many great writers have suffered – but I wish this for you, I pray you do not suffer, espeicially over something as silly as Fire and Sleep. Indeed, I fear the world is yet to wake you. But that will be your lesson. Why must you have this “Hare”? The Hare and I gazed at each other, with wonder, and yet some discomfort at being forced to consider something we never thought we would. The Hare jumped off the bench sharply, and followed. Peace-loving creatures we are, so the film clip that was here is no longer. Oh well. If it were here, the following piece would makes sense. you’re just gonna have to trust me on that one. we got spooked out by the foliage. Some of them request refunds. 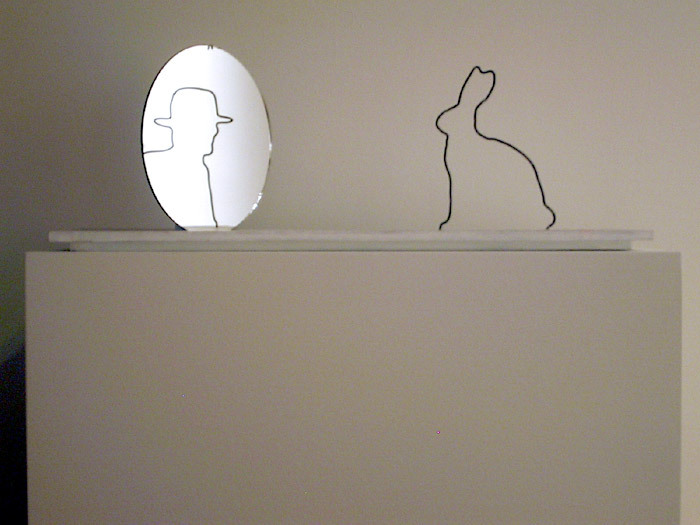 I woke up to find The Hare stabbing my image in the Mirror. And in mist, hunger, blizzard, rain. In beautiful poverty, humble opulence. And sweet-voiced work is innocence. Is one who, half-alive, begs the shadow for crumbs.